Xiaomi after the massive success of its Mi3 device which was competing with Galaxy S4 in all its specifications have come up with another smartphone which is named Mi 4 which is quite a masterpiece for the price which it is being launched. Mi 4 will be competing with the likes of Galaxy s5, LG G2, OnePlus One etc. The Mi 4 will be giving these devices a tough competition not just because of the low pricing but also because of its high end specifications as it is upgraded with 2.5 GHz Qualcomm Snapdragon 801 Quad core processor which is supported by a massive 3GB of RAM. 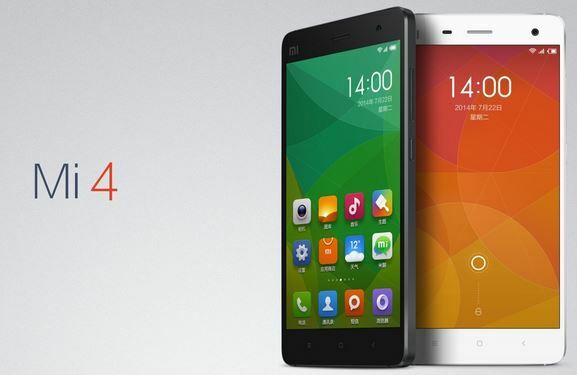 Mi 4 will be running on MIUI 6 which the company will be launched in August 16th. As rumoured that Mi4 will be running on Android have been closed and Xiaomi has said that it will be running MIUI OS itself. These help in running the 5-inch Full HD (1080 x 1920 pixels) display along with which the company has used a JDI OGS full lamination display which will give you amazing battery life because of its 3080 mAh battery with which Xiaomi has quoted that the device will be running for more than a day of normal usage. Not just that the discharge is slower but charging is also lightening fast with Xiaomi saying that it will take just 60 minutes to reach 60 percent level from Zero and to get fully charged it will take 2.5 hours. Coming to the camera it comes with a 13 MO rear camera and a 8MP front camera to help the sefie craze all around the world. Xiaomi is planning to launch the device as soon as possible with a July release on cards with Unicom version and the other networks will be following suite. The availability of Mi4 outside China like India is rumoured to be around September. The pricing of the device is the main thing which makes Xiaomi popular the way it has been in the past being touted as China’s Apple. The device is being priced as shown below. The earlier version i.e Xiaomi Mi3 which was released in India through Flipkart has got some tremendous response with the site crashing a couple of times and close to 100,000 registrations have been recorded on Tuesday itself.